Banks don't have enough capital to fix their problems, which means the Obama administration may need a lot more money to clean up the financial mess. Tim Geithner's first task as Treasury secretary may be to assess how much an effective bank bailout will cost. Can you spare $1 trillion? NEW YORK (Fortune) -- The cost of the bank bailout is likely to be much higher than $700 billion. While the Obama administration hasn't asked Congress for more money yet, some experts warn that government spending on support for struggling financial services companies will ultimately reach into the trillions of dollars. The first half of the controversial $700 billion program to help banks has already been spent -- mostly on buying up preferred shares of troubled banks. Part of the remaining $350 billion may be used to purchase troubled assets from bank balance sheets and place them in what Federal Deposit Insurance Corp. chief Sheila Bair has dubbed an "aggregator bank." "The amount of working capital you'd expect the government to take into this would be around $3 trillion to $4 trillion," said Simon Johnson, a senior fellow at the Peterson Institute for International Economics and author of its Baseline Scenario financial crisis blog. With that in mind, he thinks that the net cost to U.S. taxpayers for a broadened bailout would be about $1 trillion to $2 trillion, or between 5% and 10% of U.S. gross domestic product. He said this figure is "in line with the experience" of other nations that have tried massive banking system restructuring. Johnson isn't the first to estimate that the final cost of a bank bailout will be well north of $1 trillion. FBR Capital analyst Paul Miller said in November that just the top eight U.S. financial institutions alone needed at least $1 trillion in new common equity. But calls for a comprehensive response from the government have increased in recent weeks following the free fall of bank stocks. The KBW Bank index has dropped 35% in January after a 50% plunge in 2008, as investors worry that the government may be forced to nationalize some banks -- and wipe out shareholders in the process. 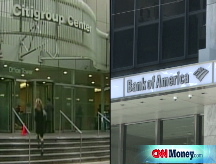 Shares of Citigroup (C, Fortune 500) and Bank of America (BAC, Fortune 500) have been particularly hard hit. "The big banks are a hope trade right now," Johnson said. Though the Obama administration hasn't said it will need more money beyond the second $350 billion installment of the Troubled Asset Relief Program, or TARP, officials have not ruled out the possibility of asking Congress for further funds. Vice President Joe Biden said on CBS' "Face the Nation" Sunday that the first task for the likely new Treasury secretary, Timothy Geithner, will be to assess whether the remaining $350 billion in funds available under TARP will be enough to stop the bleeding. Geithner said last week that he didn't yet see the need for more money, but stressed that the Treasury may have to "act flexibly" if the problems in the economy and the financial sector deepen. While officials will have to spend huge sums upfront to show the market that they won't let important institutions fail, Johnson said taxpayers won't have to end up on the hook for the entire amount of money that's being injected into banks. Johnson said the government could get warrants in banks receiving assistance that would convert to common shares once the government sells them. He also said the government could hire private equity managers to oversee the assets the government takes on -- and sell them when the time is right. These arrangements, he said, should allow the Treasury to extract some gains for taxpayers when the economic free fall ends and the banking system starts to recover. "I think we have seen prices fall to a point where the government could very easily make money, though I'd be very happy if we end up breaking even," says Gary Hager, president of Integrated Wealth Management in Edison , N.J. If the history of previous banking system rescues is any guide though, there's also a good chance that removing toxic assets from bank balance sheets could leave taxpayers with a significant tab. When Congress created the Resolution Trust Corp. in 1989 to clean up the mess left by the collapse of the savings and loan industry, legislators gave the RTC $50 billion to close or resolve troubled institutions. But the RTC wound up needing three additional infusions of taxpayer funds over six years, as regulators confronted an industry whose health was much worse than feared. In the end, taxpayers took a $124 billion loss on the RTC's operations, according to a 2000 study published by FDIC researchers Timothy Curry and Lynn Shibut. The RTC resolved 747 institutions, with total assets of $394 billion, according to the study. That means taxpayers lost 31 cents on each dollar of assets handled by the RTC -- an institution that, because it was simply disposing of the property of failed institutions, didn't have to pay for assets it later sold. In contrast, the widely discussed aggregator bank would be paying institutions that participate for their assets. Details of how the aggregator bank would decide how much to pay for toxic assets have yet to be determined. But whatever method the aggregator bank uses, it could mean significantly higher startup costs than the RTC had. So expect to see the Obama administration coming back to Congress for more money...soon. Talkback: Get your economic questions answered. E-mail realstories@cnnmoney.com with questions about jobs, housing, energy, student loans, credit cards, Americans' spending and savings habits, etc., and they could be answered on air as part of the first CNN Money Summit.